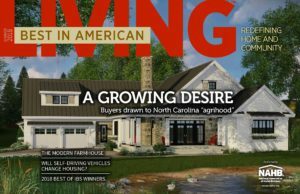 An interview with NAHB Design Committee’s very own Sean and Laura Sullivan. Adapted from blog originally posted by Aeroflow Healthcare. We asked Aging in Place specialists Sean and Laura Sullivan to explain how a home can be designed with considerations to accommodate residents and their needs as they age. Sean and Laura are a husband and wife design team who are both accredited aging in place specialists, and together they create beautiful green homes. Sean is the President and accredited Master Builder of Living Stone, and Laura is the owner and lead interior design for ID.ology Interior Design. We asked them a few questions to better understand how aging in place design can benefit people of all ages. What exactly is Aging in Place? Aging In Place is the ability for one to live in their home comfortably, safely, and as easily as possible for as long as possible. Building and designing in regard to Aging in Place (for new construction or renovation) means that different construction details or elements are considered in the design phase to ensure the home is suitable for the needs of individuals aging in their home as independently as possible. If a caretaker needs to be brought in, the home lends to their needs as well. What are some examples of aging in place design? Some Aging in Place design elements would be the inclusion of wider hallways and doorways, sufficient lighting that can adjust to aging eyes, handles and grab bars selected for ease of use, and cabinet and appliance placement planned for limited mobility use. A curbless shower makes it easy for anyone and the extra lighting helps aging eyes. How can these design elements help a person live in their home? If someone happened to use a walker or wheelchair, the home would be designed with larger spaces to allow the individual to move through the home safely and use each space without barriers. These inclusions can allow someone to stay in the comfort of their own home and avoid moving into an assisted living facility. What rooms might require more attention than others? The main level of the home, including the master suite and kitchen. At what age should a person consider aging in place renovation? Considering Aging in Place design is important for individuals of all ages. Aging in Place is not only for seniors or individuals with limited mobility or physical abilities— it makes living in a home easier and more comfortable for ALL ages and ability levels. Also, a young couple could have their aging parents come live with them or a loved one could break a bone and become temporarily in need of Aging in Place elements. Are there certain home furnishings that are more aging in place friendly? Yes, not only do we consider the physical abilities or needs of individuals, but also their health. Some characteristics of furniture used for Aging in Place homes to be considered would be the seat height and depth, the angle and ergonomics of the backs, weight, arms structure, firmness, and also whether the products are made with healthy components that do not harm the individual’s health. Are there any stipulations for aging in place when one has a pet? Considerations of amenities for caring for one’s pet could be such things as bathing stations at appropriate heights, feeding stations also at appropriate heights for both the owner and the pet, and easy access to a fenced yard or kennel. Why is “green” so important for a healthy home and how does Living Stone do “green” differently? Environmentally conscious design is important for many reasons, but the primary reason for us is the health and wellbeing of our clients. Building green protects the environment, supports local business, uses recycled or recyclable content, uses sustainable resources and utilizes energy resources efficiently. When applied in an above standard manner as Living Stone does, it benefits the health of the homeowner. Indoor air quality is the missing ingredient in Green Building and that is the real reason many people don’t see the value in paying for “green” materials. However, when you consider that homes are being built with often inadequate ventilation systems, you can actually be causing damage to your health. According to the EPA, we spend up to 90% of our time indoors. Our indoor environment can be more toxic when we fill our homes with products with VOC’s, which are present in everything from cleaning equipment to building materials such as glue, paint, varnishes, and wood preservatives. VOC’s are emitted as gasses from certain solids or liquids and can have adverse effects on your health. A green home is more than just an energy efficient home. It’s a home that prioritizes your health and wellbeing. If someone is considering a remodel or new construction that includes Aging in Place, what should they look for in a contractor/builder/interior designer? We are both Certified Aging In Place Specialists as well as Certified Green Professionals, which gives us a more astute awareness and focus on the indoor air quality for our clients’ health. What are some “outliers” in the design process that most people don’t know about? Any interesting/strange techniques to make a home more comfortable for aging? Most individuals overlook or underestimate the importance and value of space planning during the design phase of a renovation or new construction. Bringing in a professional service like those we offer at Living Stone and ID.ology give our clients the best approach possible when designing a home.